Wafer antenna, credit Greg WylerWhat will the cost and capability of these antennas be in ten or twenty years? What would be the applications and implications of ubiquitous wireless networks? You might have some short-term guesses, like smart cities, but farther out it's science fiction — Gaia, the Noosphere, 1984? Three companies, OneWeb, SpaceX and Telesat, plan to provide global, low-latency broadband Internet service using constellations of low-Earth orbit (LEO) satellites. They anticipate millions of $200 to $300 end-user ground stations and that will require a critical technology — cheap, electronically-steered antennas that can seamlessly switch from one satellite to another as they move across the sky. Antenna development has seemed to be a sticking point, but each of these companies has made a promising announcement during the last month. 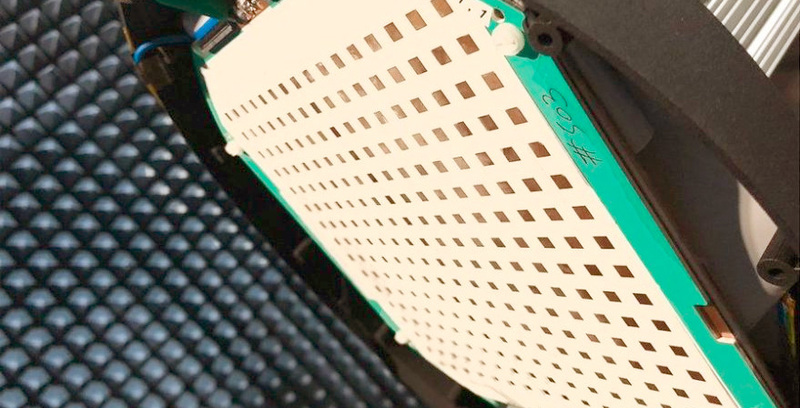 OneWeb founder Greg Wyler announced that his self-funded side project, Wafer LLC, has developed a flat, low-power phased-array antenna that could be mass produced for $15. Wyler said tests of prototypes showed 50 Mbps capacity per antenna "tile" and said multiple tiles could be combined. (I assume that combing them would cut into the number of satellites that could be visible at any one time). The prototype uses the Ku frequency band that OneWeb's first satellites will use, but Wyler said they can be redesigned for different frequencies and orbit altitudes at little change in cost. Telesat has two test satellites in orbit and Ball Aerospace announced a successful demonstration of communication between the test satellites and Telesat's ground station in Canada. They reported quick and seamless switching between the satellites and the speed and latency needed to stream video. (I asked about the characteristics of the video, but got no comment). Ball also says they will be able to mass produce their antennas. It is noteworthy that Telesat has said they would concentrate on the maritime, aviation and cellular backhaul markets until the cost of end-user antennas came down. It seems to have done just that. SpaceX also has test satellites in orbit, and they report high bandwidth and 25 ms latency, but, unlike OneWeb and Telesat which are working with a number of suppliers and partners, they are vertically integrated, and are designing their own antennas. Earlier this month, SpaceX filed an application with the FCC for permission to deploy one million end-user Earth stations. The application describes their antennas as employing "advanced phased-array beam-forming and digital processing technologies to make highly efficient use of Ku-band spectrum resources by supporting highly directive, steered antenna beams that track the system's low-Earth orbit satellites." In addition to steering the beams, they are able to vary power as a function of the angle between the ground station and satellite. These antennas will enable Internet connectivity in homes, schools, clinics and other fixed location. They will also be found on things that move like ships and planes. If all goes well, they will be on the roofs of cars and trucks as well (Teslas first). They will play an even larger role in terrestrial communication. Since they have no moving parts and do not require precise alignment, they will be reliable and easy to install. They will become staples of 5G mobile installation, community networks, and other do-it-yourself projects. They will be deployed in dense urban areas, rural areas, developing nations, etc. (Years ago, one of my classes managed the networking of several of the dorms on our campus — these antennas would have made that a snap). What will the cost and capability of these antennas be in ten or twenty years? What would be the applications and implications of ubiquitous wireless networks? You might have some short-term guesses like smart cities, but farther out it's science fiction — Gaia, the Noosphere, 1984? Back when I was at Sun we worked on a project that we described as the "Sparcman" (pun on the then popular Sony Walkman), i.e. mobile ubiquitous computing. We worked with a post-Soviet company to develop a small flat panel antenna that could be thrown into a backpack (in our case, a backpack on the back of a bicycle rider actively riding) that could track and communicate with a constellation of low-earth-orbit satellites. Our desired data rate was small by today's standards - if I remember, we wanted fast dial-up modem speeds, such as 14.4kbits. Projected production cost was about $5 each; they looked a lot like DVD disks. Our project kinda went off into the weeds as we sank into the problem of local terrestrial pico-cells for higher bandwidth campuses, so we never went live with the LEO stuff. I wonder what ever happened to that technology? And I wonder whether our (apparent, but unproved) success was because we were down in the kilobits/second range rather than aiming at tens of megabits/second? We also did not concern ourselves about things like trees or rain. Local Time: Saturday, April 20, 2019 03:48 PM PDT – Page Load: 0.3204 Sec.